I got to play with several One Laptop Per Child (OLPC) XO laptops a few weeks ago as the result of some colleagues being part of the funding program (or something. Actually, I'm not entirely sure where the laptops came from, or why we were invited to play with them. Never mind). The XO's are physically rather cute machines (they have ears for the wireless antennas, and they're brightly-coloured), and seem to be built strongly enough to last a fair bit of use and abuse. The Linux-based OS and bundled software seems to me to be easily usable without needing instructions or instructors (but then I'm a nerd), a reasonable platform for downloadable content and games or teaching apps, and somewhat useful as-is. The networking includes a nice mesh network setup for use to communicate between the XO's when there's not a reliable WiFi access point nearby to communicate with the rest of the world. Overall, not a bad little combination of hardware and software (well, a Hello Kitty version would be nice, and the keyboard's a real pain to use, but in general it's just fine). But fine for what? And that's the question everyone I know who plays with them asks. The obvious criticism is that the laptops solve the wrong problems or that they divert resources from the real problems (like lack of clean water, lack of trained teachers, etc.) that their target users face. And these laptops are primarily both an artifact of, and a way to interact with, a connected technological society, and in the absence of that society (or at least some facsimile of it), it's not hard to imagine these descending like UFOs on some sub-Saharan desert village, unwanted, unusable, and basically just inert objects of derision or disdain (or of instant commerce). The whole thing has the air of a classic technological fix  a technologist's fix  looking for a suitable problem to solve. the law of unintended consequences can work the other way too, and produce something interesting and useful in unforeseen ways  it's hard to guess what the creative instincts of kids might do with something like this. 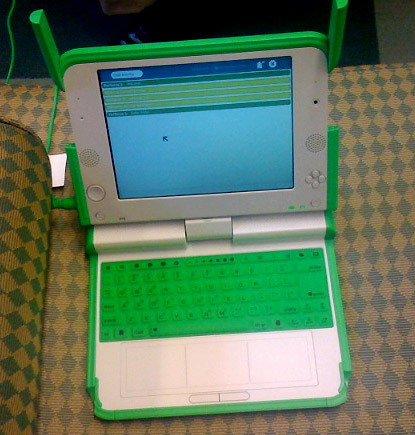 And in any case what seems most likely to sink the whole OLPC idea are commercial and political machinations here in the First World, not the lack of power or connectivity or trained teachers in the third. But I'm not too optimistic, at least for release 1.0; I'm guessing a lot of these (or their like) will end up as playthings in the hands of first and second world kindergartners. Or, maybe more likely, ironic accesories in the hands of hip City artwankers.